I wrote this story when I was a staff sergeant serving as the public affairs representative of Marine Corps Recruiting Station Oklahoma City. The story won in the Best News Feature category of the annual Thomas Jefferson Awards. 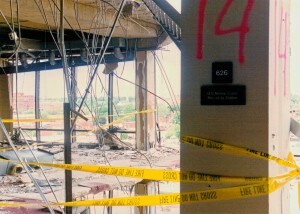 April 19, 1995 — A Marine sergeant sat dazed and bleeding in what remained of his gutted office. The strong odor of gas was in the air and nothing could be seen through the thick, black smoke billowing in through the shattered windows. “I’m in hell,” thought Sgt. Tad Snidecor, Recruiting Station Oklahoma City supply clerk, seconds after the April 19 bomb ripped through the Federal Building in downtown Oklahoma City. But as the smoke began to clear and other Marines became visible, Snidecor realized he was still among the living. What was just seconds ago the supply office of a Marine recruiting station was now unrecognizable. Entire walls had disappeared and waist-deep rubble was everywhere. Lights swung by their wires from what remained of the ceiling as dust and fiberglass hung in the air. Snidecor stood up and felt with his hand a cut on the back of his head. It was the worst of his cuts and scrapes. He had been sitting in a high-backed chair with his back toward the blast so most of the glass and flying debris flew over his head, leaving him relatively unscathed. To Snidecor’s right was GySgt. Earl Bussell, supply chief, on his hands and knees, bleeding from deep cuts on his left arm and head. In front of Snidecor was Capt. Michael Norfleet, officer selection officer, on his back with a pool of blood covering his right eye and blood gushing from other head wounds. Because there was still thick smoke in the room, Snidecor’s first reaction was to get to what used to be the window that made up the entire south wall. He looked down into the street six stories below and could see that the smoke was coming from two burning vehicles in the street. Looking to his right, he could see the collapsed section of the building, including part of the recruiting office. Snidecor turned around to find the other two Marines had gotten to their feet and were trying to figure out what had happened. With Bussell’s help, Snidecor laid Norfleet on a clear desk. Snidecor then climbed over the wreckage and hunted for the medical supply locker that was in the supply storage room. It wasn’t a room anymore since there were no longer any walls, but the locker he was looking for was surprisingly still standing intact. Snidecor got back to Norfleet and bound his head and eye with two rolls of gauze. By this time, Norfleet was feeling pretty weak, and Snidecor knew the captain needed medical help soon. Bussell managed to grab Norfleet by the shoulders, but Bussell was feeling very weak himself and lost his grip twice. Norfleet yelled for them to put him down, deciding it might be better if he just tried walking out with some help. Snidecor next found SSgt. Jack Jocsing, recruiter from Moore, Okla., pulling himself out from beneath a pile of junk. Jocsing was covered with blood, dirt and debris. He had started wandering around and blindly running into things by the time Snidecor could get to him through the debris. But first Snidecor guided Jocsing to a clear area on the floor and had him lie down so he could administer first aid. Guided by Jocsing’s directions, Snidecor used the remains of the gauze to wrap a gash on Jocsing’s arm and took off his own shirt to use as a pressure bandage on Jocsing’s leg. The leg was bleeding so badly, Snidecor thought about using a tourniquet, but decided a pressure bandage would do. “I didn’t want him cursing me later if his leg had to be cut off because I used a tourniquet,” he said. While doing first aid, Snidecor could hear someone else calling out for help. Snidecor continuously yelled back to keep him reassured he wasn’t going to be left behind. Snidecor then helped Jocsing up. At this time, Capt. Matthew Cooper, operations officer, appeared. Cooper, like Snidecor, had also been lucky and sustained only minor injuries and a cut on his arm that later required 15 stitches. He had just returned from having helped Barbara Hedricks, the recruiting station’s civilian computer operator, to the stairwell. Cooper and Snidecor then worked as a team. 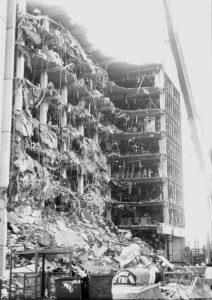 Snidecor was of a lighter build and could climb better through the rubble to find victims, while Cooper, being bigger, would be better to carry people out if necessary. This wasn’t really talked out or planned; it just worked out that way. Cooper then took Jocsing by the arm and helped him to the stairwell and down to about the third floor. Jocsing was able to continue on his own from there, so Cooper headed back to the office. Guided by the voice he heard earlier, Snidecor found GySgt. Paul Cooper, pool coordinator, stuffed under a desk less than three feet from the edge of where the building collapsed. Snidecor began pulling stuff off the gunny. A few minutes later, Capt. Cooper returned to help. Once they finally freed the gunny, they could see he had a huge gash in his left leg that wasn’t bleeding and a cut on his left arm that was bleeding a lot. Capt. Cooper took off his uniform shirt and bandaged the arm. Snidecor and the captain then got GySgt. Cooper up and got him to the stairs. The captain took him down while Snidecor went back into the office. While working, Snidecor and Capt. Cooper assessed the damage to the office, trying to figure out where the remaining two Marines, Capt. Randolph Guzman, executive officer, and Sgt. Benjamin Davis, operations clerk, could be. They could see the section where the two Marines had probably been had collapsed and was in a heap three stories below. Capt. Cooper decided to search the third floor area while Snidecor continued to check around the sixth floor office. 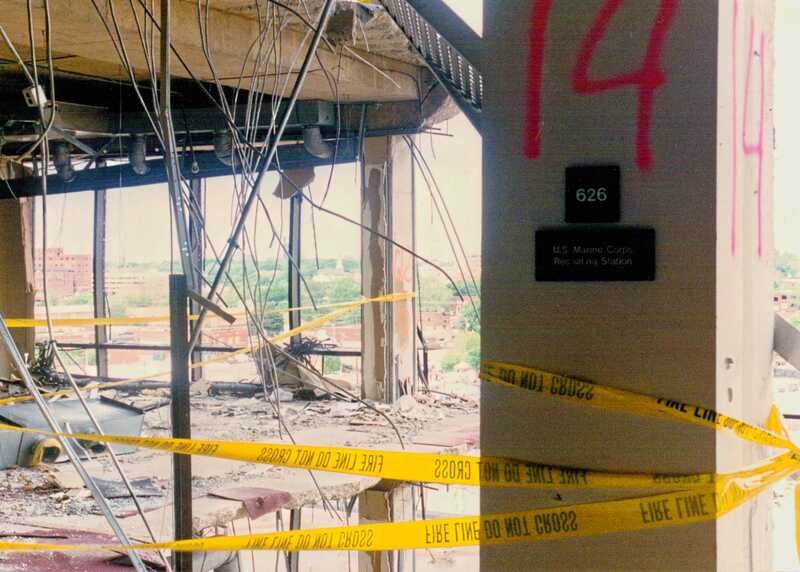 Snidecor hoped that Davis and Guzman might have been blown free of the collapsed part of the office. He searched everywhere he could get to, but in vain. By the time Snidecor finished his search, firemen finally came into the office. Two weeks later, physical and emotional wounds have begun to heal. Guzman’s and Davis’ bodies were found and removed from the site with ceremonious honor befitting their service to country and Corps. All Marines and the civilian injured have since been released from the hospital and are resting at home and eagerly wanting to get back to work so that by keeping busy they can put the incident behind them. The recruiting station has been relocated and the Marines are trying to rebuild from scratch everything that was lost. Snidecor is back at work getting things done just as he did before April 19. But the experience has definitely left its mark on him. On April 20, Commandant of the Marine Corps, General Carl E. Mundy Jr., arrived in Oklahoma City to visit the injured Marines. The bombing experience hasn’t shaken his resolve to stay a Marine, though. He says it was being a Marine that guided his actions that day.